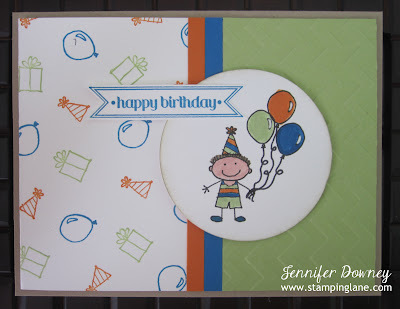 Stamping Lane: Happy Birthday Jack! Happy Birthday to my little man, Jack! It's so hard to believe he is turning 3 today! Time moves so fast. My baby is growing up and learning so much! He makes me laugh everyday, he teaches me new things, and he has shown me what unconditional love is. I am truly blessed to be your mommy, Jack! I love you more than anything! I couldn't part with my All In The Family Set and its coordinating Accessories Set when they retired last year. They were two sets that I knew I would continue to use, and I have! I'm off to celebrate the day with Jack as only you can with a 3 year old, we're heading to "The Train Room"! Happy Stamping!